Less than a day after its launch, the big Mosul offensive prepared for more than a year by the US, the Iraqi army, Kurdish forces and others, ground to a halt Tuesday Oct. 17, debkafile’s military sources report – although none of the parties admitted as much. Iraqi Prime Minister Haidar Al-Abadi said his troops were busy opening up corridors for some million civilians to escape, while US sources suggested that the Islamic State would use primitive chemical weapons against the advancing Iraqi and Kurdish forces. Both had the ring of cover stories to account for the spearhead forces, the Iraq army’s 9th Armored Division and the Federal Police special anti-terror units, being thrown back Tuesday on their way to Mosul from the east and the south, while still 10-15km short of the city. They sustained heavy losses in lives and hardware. 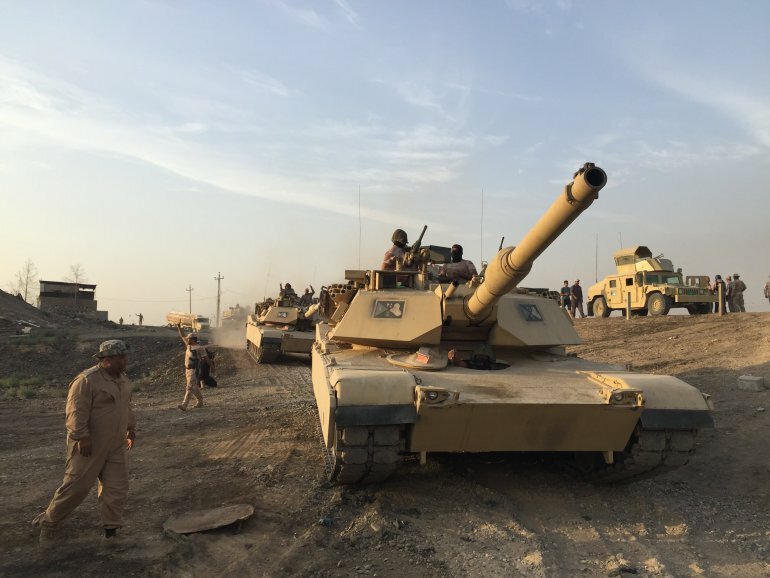 The 9th Division and its newly-supplied heavy US Abrahams tanks were stopped at al-Hamdaniyah outside Mosul and retreated, recalling a previous defeat at ISIS hands in June 2014, when troops of the same division fled under Islamist attack, leaving their tanks behind. The Iraqi anti-terror force withdrew from the village of al-Houd outside Mosul, a move which left the Kurdish Peshmerga no option but to stop its sweep of the villages around the city or expose their flanks to ISIS suicide and car bomb assaults. Tuesday night, both Iraqi and Kurdish commanders announced a pause in their advance and said they would meet Wednesday to decide how to proceed. The Kurdish Peshmerga’s role in the battle of Mosul has run into a further major impediment, which likewise has not been publicly aired. It turned out Tuesday that at least 3,000 of the 12,000 Kurdish fighters taking part in the offensive came from the banned Turkish underground PKK (Kurdish Workers Party) which is fighting the Turkish government. They came down from their northern Iraqi strongholds in the Sinjar and Qandil mountains. Ankara thereupon warned Washington and Baghdad in a strong ultimatum that unless those fighters were pulled off the field, Turkish troops would step in to attack them. A second front within a front would effectively torpedo the entire Mosul liberation campaign against ISIS before it gets underway. The first bricks of the military Tower of Babel predicted by debkafile in the background report below were set in place sooner than expected. Sunday night, Oct. 16, Iraqi Prime Minister Haidar al-Abadi, supported by a bevy of generals, announced that the military operation to recapture Mosul from its two-year occupation by the Islamic State had begun. 1. American special operations, artillery and engineering units – equipped with floating bridges for crossing the Tigris River – plus the US air force for massive bombardment to crush enemy resistance. 2. Iraqi army armored divisions, special ops forces, regular troops and anti-terror police units. 3. The Iraqi Kurds’ Peshmerga. The Iraqi prime minister pledged formally that only Iraqi fighters would enter Mosul, i.e. no Americans, Kurds or other non-Iraqi forces. It was a pledge that neither the Iraqi Sunni and Shiite combatants nor the Kurdish and Turkmen fighters trusted him to uphold, after similar promises went by the wayside in the US-led coalition battles fought in the past two years to retake the Iraqi towns of Ramadi, Tikirit, Baiji and Fallujah from ISIS. The first forces to enter those cities were by and large pro-Iranian Iraqi Shiite militias, especially the Bader Brigades and the Popular Mobilization Units, under Iran’s supreme Middle East commander Gen. Qassem Soleimani. Nonetheless, despite the ravages they wrought in those Sunni cities, US air support was forthcoming for their advance, while in Washington US officials pretended they were helping Iraqi government army units. With regard to the Mosul campaign, Obama administration officials and military officers, like the Iraqi prime minister, insist there will be no repetition of the Iranian-backed Shiite invasion and conquest of yet another Sunni city, where a million inhabitants still remain. They don’t explain how this will be prevented when those same pro-Iranian Iraqi Shiite forces are already massing northeast of Mosul, near the Iraqi-Syria border, and standing by for the order to advance into the city. Tehran quite obviously has no intention of being left out of the epic capture of Mosul. a) To actively frustrate Kurdish Peshmerga entry to Mosul, although its 15,000 fighters out of the 25,000 invasion force are a vital element of the spearhead thrust into the city. Ankara has warned that if Kurds set foot in Mosul, Turkish troops will follow. b) To block the path of Syrian Kurdish YPG militiamen from entering Iraq and linking up with their Iraqi brothers-in-arms. c) To provide backing, including Turkish air support, for the Iraqi Turkmen militias still present in the Turkmen quarter of Mosul. debkafile’s military sources count six assorted military groupings taking part in the liberation of Mosul. They have nothing in common aside from their determination to drive the Islamic State out. They are utterly divided on the two main aspects of the offensive: How to achieve their common goal and what happens to Mosul after the Islamist invaders are gone. The underlying US rationale for embarking on this high-wire operation is President Barack Obama’s aspiration to achieve Mosul’s liberation before his departure from the White House in January, in the hope that this landmark success will provide a major distraction from his administration’s failed policies in Syria. The Islamic State might have been expected to take advantage of the prior warning of the offensive for a stand in defense of the Iraqi capital of Abu Bakr Al-Baghdadi’s caliphate and so exploit the conflicting interests of the invading force. But ISIS leaders decided against waiting for the combined offensive. Indeed, according to debkafile’s sources, thousands of jihadis made tracks out of the city two or three months ago, relocating the bulk of their combat strength and institutions in two new locations: in the western Iraqi desert province of Anbar at a site between the Jordanian and Saudi borders and eastern Syria. Several hundred fighters were left behind in Mosul to harass the US-Iraq-Kurdish armies as they advance into the city and exploit the invaders’ discord to retain a foothold in Mosul.